Poor M. She is still recovering from her wisdom tooth extraction. The procedure itself went smoothly, and I’m totally kicking myself for not setting something up to record the car ride home, because she was super-entertaining before the drugs wore off. Now she’s got chipmunk cheeks and she’s still opening her mouth as little as possible, so she’s not enjoying herself. She’s also still mostly eat soft-and-pretty-bland food. 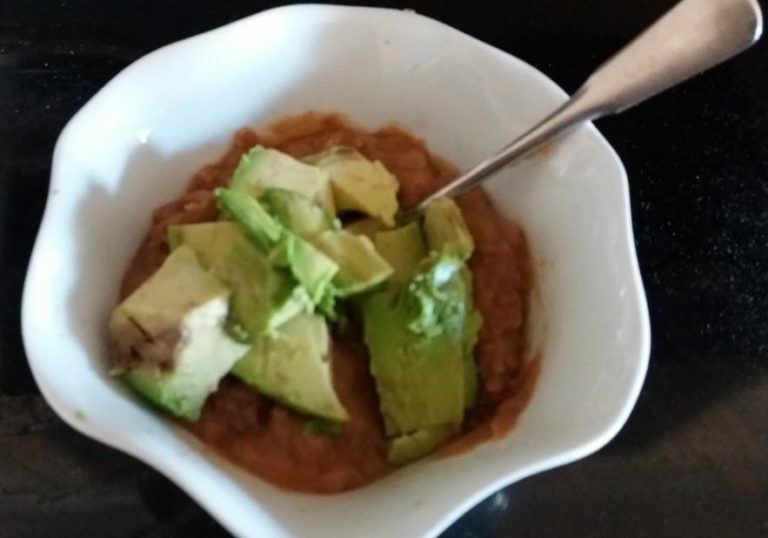 A particular favorite at the moment is refried beans and avocado. It is a rare weekend when we don’t have many plans, which is just as well since M is in recovery mode. J and I each went to a party on Friday night, and Cute W ran in the Stockadeathon because he is a super-awesome beast. 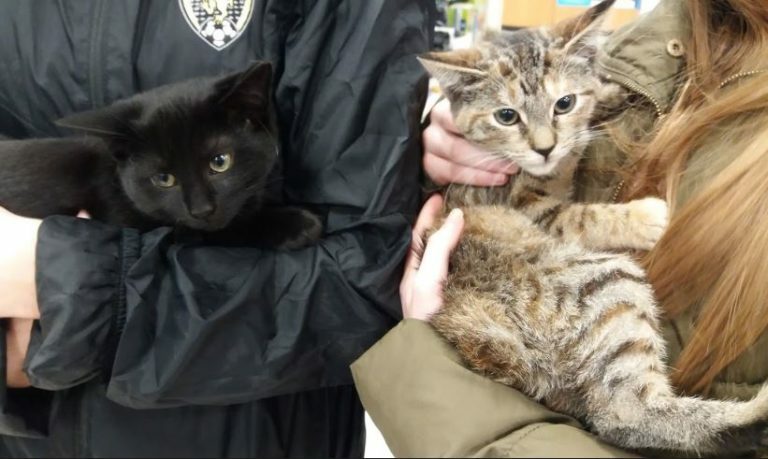 But the main thing that happened over this weekend is that we adopted two new kittens from the Kitten Angels at PetSmart! We went to the open clinic during PetSmart’s National Adoption Weekend toting a cat carrier, just in case. We weren’t sure if we’d definitely click enough to choose one at all (especially after our recent miss), and we were open to potentially bringing home two, but it wasn’t a done deal. Or so I thought. As it turns out, it is extremely difficult to hold a snuggly kitten and not want to take them home. 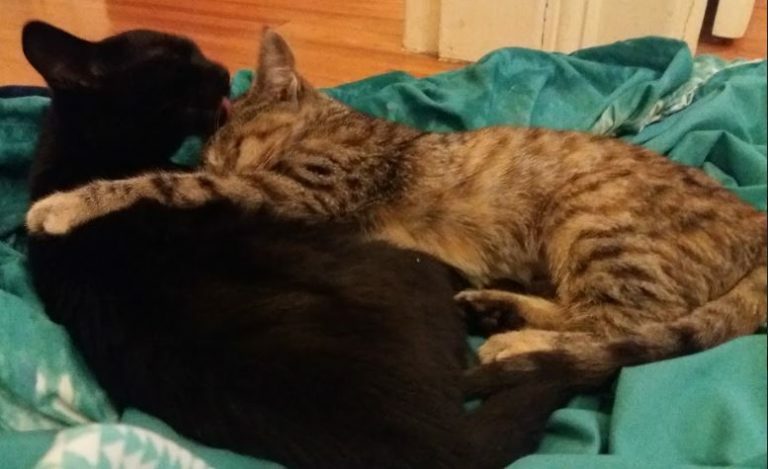 These are brother (black) and sister (tiger-striped), and they’re about 12 weeks old. We were cuddling up with four from a litter that had been taken with their mama from the street and had most recently spent a week in a foster home. These two seemed the most content to be snuggled. Since we’ve brought them home, they’ve spent part of their time hiding, yes, but they are also already exploring, they’ll purr as they’re petted, and they waited until we showed them the litter box to take care of business. They also like each other very much. Sometimes the boy will venture out from a hiding place, then meow for his sister to join him, and she’ll come afterwards. He seems to be quicker to explore, but she’s a little bit less shy about actually interacting with us or pouncing on a toy. It’s an excellent long, lazy weekend for us to get settled in together, and it’s a great distraction for M.
We still haven’t chosen names. This seems to bug me more than the other members of my family. I am constantly throwing out ideas for names, and I am mostly getting rejected. We have a couple of girl names that I think we all like, but the boy name’s been tougher, and we feel like they should coordinate. So that’s an ongoing conversation. Maybe we’ll figure it out by tomorrow. Cuties! We have a black cat (LC for Little Cat) but we lost her tiger-striped brother (Parker, after the tiger in Life of Pi) in January. Aww, Maggie, sorry to hear it. Love the Life of Pi reference! At the rate we’re going with naming, they’re likely to be Brother and Sister at this point. . . .